I didn't read this when everyone else read this--I just was not interested in reading it...a bunch of animals??? Silly! Well, I was wrong. I loved this--really loved it and I missed out on fond memories for 40 years! I loved this book and was totally swept away into the world of rabbits. This is an awesome book. If you like Sci-fi or Fantasy you should also give it a try. 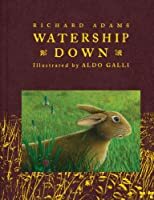 A wonderful tale of sense and survival written with a rabbit as the main character. You will love this book.